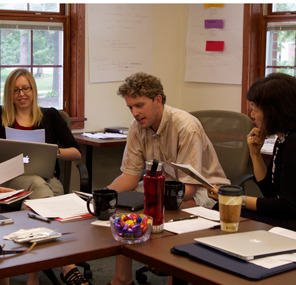 The Wabash Center is committed to developing faculty members who are critically reflective about their teaching. Our Early Career Teaching and Learning workshops are designed to engage the participants in developing the craft of teaching, understanding one’s own teaching vocation, and analyzing how one’s institutional context shapes the work of the classroom. The Workshop Fellowship Program extends this work by awarding a fellowship of $5000 to workshop participants for a teaching project that takes place in the academic year following the workshop. A good teaching project will address questions arising from the faculty member’s classroom experience and teaching. It might focus on learning more about the students being taught and the competences they bring to the classroom; it might involve a specific course that did not go well the first time it was taught; it might seek to understand why a particular concept is challenging for students to learn; why a particular topic is encountering resistance; or it might involve deepening the faculty member’s understanding of how to facilitate difficult conversations in the classroom, such as those around racial privilege, gender and sexuality, or interfaith issues. Who are my students? How do they learn? What do I want them to learn? Why would they care? How does this subject matter touch their interests or passions? What are my departmental or institutional learning goals? How do my classes fit in with the courses that other faculty members are teaching in the school/department? What about my teaching poses a challenge for my students? How can I most effectively teach them? How do I know that they are learning what I want them to learn? Apply online by August 15 of the second summer of the workshop. Link the steps involved in your work to specific dates, including preparatory activities, dates of classroom exploration or work involved, and assessment processes. Critical Reflection on your experience and what you learned. Revisit your project description and goals: What did you learn about teaching? About your students and how they learn? About your institutional context and its effect on your classroom? Projections: What do you need to do next and who/what will be helpful to you in developing this next phase? Learning Abstract: In 150 words, describe your central question, the work involved, and what you learned. Submit the Final Report electronically through email attachment. Once your project is submitted and approved, an agreement letter will be sent outlining the terms between you and the Wabash Center. A check for one-half of the amount ($2500) will be sent as soon as the paperwork has been completed. The second half of the fellowship ($2500) will be sent upon receipt of the Final Report. No taxes are withheld from the fellowship awards; the amount will be reflected on the IRS 1099 forms sent to you by Wabash College at the end of the calendar year. Any significant change in your project must be approved in advance by the Wabash Center. Send a letter or email to Gina Haile (Grants Coordinator) that describes and justifies the changes so that we can determine whether the new plan falls within the intent of the approved fellowship. If during the course of the fellowship you are unable to meet the terms of the award, you are obliged to inform the Wabash Center immediately. The fellowship award is contingent upon full participation in all three sessions of the Early Career Workshop.